Custom Blade Flags will make your displays extremely dramatic and highly visible. Available in the brightest gamut of color choices, your brand on these will remain highly visible whether the wind is blowing or not! Well suited for both indoors and outdoors, these banners are easy to store and transport. The best part is that these banners can be attached to the poles in just a few seconds. 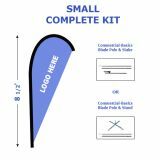 Get your message out on a proud display with these brightly colored blade flags during college homecoming, sports events, stadiums and tradeshows. Shop from our collection of Personalized Blade Flags and avail the best prices, quick shipping and much more! 100% customer satisfaction guaranteed! Looking for a great way to make your indoor and outdoor displays visible and eye catching to impress your audience? Your search will invariably end at these impressive Custom Blade Flags that are mounted on flexible poles that rotate freely with the wind. Advertising tools will grab easy attention of the street traffic and your prospective customers. Vibrant and visually arresting, thesesignage can be customized with brand, mascot, message or slogans to get your message out in a big and bold fashion. When you need something bold and extra special to garner publicity and tomake the audience stop and stare at your billboards, custom blade flags will be a good choice. The attractive vibrant colors and the generous imprint area will make these flags any marketer’s dream! The best part is that, many of these blade banner signs can be purchased with flag poles and hardware for total advertising solutions. 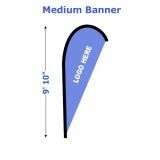 Made of high quality materials, these portable outdoor advertising flags are designed to last long. Light weight and easy to assemble, these freely rotating flags will ensure an eye popping 360 degree display, which will evengrab the attention of the casual passers-by! Reasonably priced and highly visible, Advertising Blade Flagshave become one of the hottest choices among marketers today. Need help with your custom design? Call us and we can help you turn your dream design into print. Browse our collection of Personalized Blade Flags to shop the best rates. Should you need any tips, call us at our toll free number (888) 872-3524 or email us at customercare@tuffflags.com and our team will be happy to be of assistance to you.